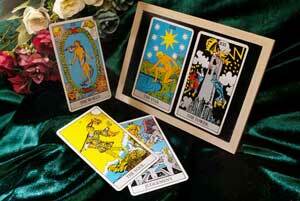 Tarot cards have been used for many centuries to reveal the future and discover hidden truths. Tarot has grown in popularity and has become one of the most effective tools for personal growth and self discovery. It speaks a language that is simple and accessible for everyone. The 78 cards in the pack carry a mystical ability to provide quick and direct access to your intuition, to your soul. They are mirrors of your emotions, your feelings, and your energy. Each card has an image, a number and a name which have specific meanings. The Tarot provides a direct path to understanding the patterns that are at work in your life and, magically, they seem to ‘predict’ events or patterns that are due to happen. They reveal the energy and the mood that is around you in the present moment. They are not “spooky” or “evil” – they are a wonderful tool in helping you to understand what is going on in your life and how you can make powerful changes to create the magical life you deserve!